Come March, the NCAA Tournament will look a little different as it adds four more teams. The final four at-large teams and final four automatic qualifiers in the new tournament format. 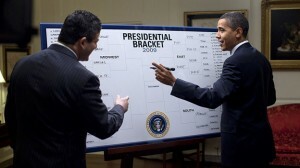 It was anticipated the tournament would expand to 96 teams. Instead, the four additional teams will play four play-in games before the traditional Thursday/Friday opening round. The play-in games will be called the “First Four” and would be played the Tuesday or Wednesday after Selection Sunday (when the tournament teams are announced) and will be on truTV. Two of the play-in games will be between the No.65-68 teams (as expected). Its winner will go onto to face the No.1 teams in Thursday and Friday’s games. The other two play-in games will between the final four at-large winners (the final four teams picked to be in the tournament).